Bread Garden Market — Saturday, June 13 from 2:30 – 5 p.m. Many people don’t realize how many fermented foods they consume on a daily basis: In addition to alcoholic beverages, many types of bread, coffee and chocolate are products of the fermentation processes, not to mention the pickles on our burgers, the vinegar on our salads and the sauerkraut on our hot dogs. This is the very type of awareness that Tara Whitsitt, who will visit Bread Garden Market on Saturday, June 13 to facilitate a “wild vegetable fermentation and starter culture swap,” wants to spread on her cross-country tour. Called the “Johnny Appleseed of traditional pickling” by the New York Times, Whitsitt travels in a 40-foot bus complete with a kitchen and wood stove in order to spread the good word of fermented food through workshops and potlucks. On her tour, she teaches recipes like sourdough bread, as well as items like Japanese nukazuke (a type of pickle), mint-lemon balm wine and beet kvass (a drink). If that’s not enough talent and oddity to draw you out to her culture swap this Saturday, she’s also a talented artist. I chatted with Whitsitt to learn more about her tour, and to geek out about food like sourdough and kimchi. How did your passions for fermenting and growing food, living communally and teaching begin? I grew up in Texas, went to college in Louisiana and moved to the Northeast shortly after. I lived in Brooklyn for many years and that’s where I began fermenting. A year after discovering fermentation, I left for the west coast to work on farms and ferment full time, as well as learn more about food systems and our eco-system on a grander scale. I live with an intentional community back home [in Eugene, Oregon] and the lifestyle has inspired me to live more sustainably — conserve, share and work as a unit to create greater means. Fermentation on Wheels is a culmination of all of this. 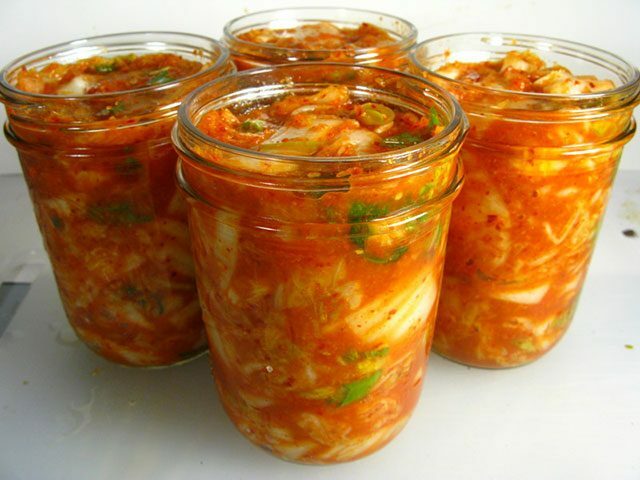 Did you consume many fermented foods as a child? Fermented foods were never a staple in my youth — I certainly ate cheese and yogurt. I didn’t consciously consume fermented foods until I was in my second year of college, studying overseas in Denmark. We ate fermented vegetables, mostly. I also ate miso and other Japanese ferments regularly with fellow exchange students. I studied linguistics in school and have always had a kind of love affair with food — I did a lot of cultural mingling and I naturally flocked to other lovers of food. What is the most popular or unusual food that you teach about in your workshops? Right now I’m mostly teaching vegetable fermentation, via wild bacteria. I use the “sauerkraut method” — where we simply salt the vegetables, no water necessary. I use whatever vegetables I can find from local farmers, and I usually buy or farm them anywhere from a day to two before the workshop. I never make the same ferment twice — I encourage people to experiment often. Cabbage is usually involved, though, since it’s easy to start with. In the winter months I do a fair amount of sauerruben. I generally teach more approachable ferments — vegetables, kombucha, kefir, sourdough. All my workshops are by donation, and these topics are cost effective. Sometimes I get lucky and spend time with people who already have quite a bit of knowledge as well as nifty ingredients on hand, and I’ll teach miso, amazake, tempeh, wild beer, etc. My favorite unusual ferment I’ve taught on this trip is fermented green tea, for Lahpet Thoke. Why a bus? How is does the traveling itself fit into your project? The bus brings me to the people who need this knowledge. It also forces me to be more thoughtful about how and what I consume, which follows along with my mission. Throughout history fermented foods have traveled, and in many cases that’s how they are with us today. Nomadic tribes carried cultures thousands of miles across continents; thanks to them they are more widespread today. For example, sauerkraut was originally a Chinese tradition, made with wine. Thanks to the Tatars it was brought to Eastern Europe, and today we think of it as more German cuisine (since we picked up the Germanic name, sauerkraut — if we were more Romantic speakers perhaps we’d be calling it choucroute). I find it super important, especially micro-biologically speaking, to spread cultures far and wide. That’s what I’m doing. I really admire your zine and illustration work. What is your training and/or experience with visual art, and how does it fit into the fermentation project? I’ve always dabbled in art making, mostly photography. I discovered I was talented in illustration the winter before I launched Fermentation on Wheels. I took a community college course — Intro to Drawing. I actually took the course in an effort to make more attractive labels for my ferments. My teacher was a freelance illustrator and immediately took me under her wing. A few months later I was freelancing too. What kind of impact are you hoping to make? In an ideal world, what is the result of your tour? I want to inspire people to live more sustainably and with more thought for food. I aim to bridge communities, so they experiment with fermentation more and more long after I’m gone. In many communities I’ve visited, enthusiastic fermenters have become more involved in their practice, motivated to teach as well. I want to set an example for more open spaces in food education. Before I began fermenting, I thought I needed sophisticated tools; the hands-on education seemed out of reach because it was expensive. My work as an educator breaks those obstacles. Making an experience accessible, creative and interactive allows more space for impact.